Is this baby 24 years old? Emma Gibson was conceived in 1992 but not born until 2017. 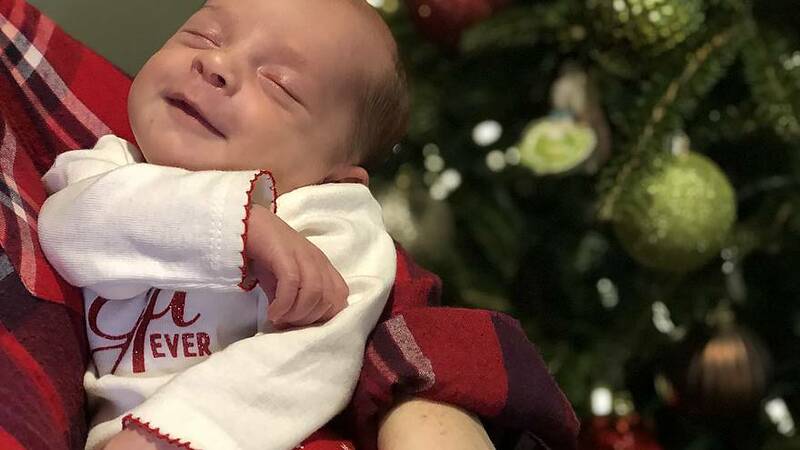 Gibson, born November 25, was frozen as an embryo and donated to a Knoxville faith-based clinic that specializes in embryo donation and adoption, doctors and her parents said. "Do you realize that I'm 25 years old? If the baby was born when it was supposed to born, we could have been best friends," Emma's mother, Tina Gibson, told local NBC affiliate WBIR. "I think she looks pretty perfect to have been frozen all those years ago," Emma's dad, Benjamin Gibson, said in a statement. While it's not possible to know if the birth is a record, it's likely close, the clinic's president and medical director, according to Dr. Jeffrey Keenan. "We had our medical library, which is very good at finding things, look to see if they could find anything older than that and they could not," Keenan, who performed the embryo transfer, told NBC News. "But it is kind of neat that this embryo was conceived just a year or so before the mother was." Fertility clinic records are private and there are no official databases on the ages of embryos when transferred to a woman's uterus. But outside experts said it's possible Emma's birth set a record. It's a claim that difficult to verify, said Sean Tipton, spokesman for the American Society for Reproductive Medicine. "These are not the kind of claims that are generally made in peer-reviewed scientific publications. They are typically the kind of claims that are made by marketers," he said. "I think it is probably fair to say if it is not the oldest, it would be among the oldest," said Dr. David Adamson, CEO of Arc Fertility in San Jose, California. "I'm not personally aware of a medical report where an older embryo has resulted in a live birth." Emma would have been conceived a year and a half before her mother, Tina Gibson, was born. "I think it makes it all that much more of a miracle," Tina Gibson said. Not that it matters, the experts agreed. "Medically, the amount of time an embryo is frozen is not very important," Tipton said. "The babies are the same," Adamson said. "Overall, IVF babies do very well. Over all, the frozen embryos do just as well as the fresh embryos." The risks all come at the moment of thawing out the embryo, Keenan and Adamson both said. If an embryo survives being thawed out, then it's no less likely than any other embryo to result in a healthy pregnancy. And there is no evidence that frozen embryos, no matter how old, have any higher risk of birth defects. Keenan's clinic, the National Embryo Donation Center (NEDC), exists to save frozen embryos from destruction. "It's a God thing," Keenan said. There are no standard statistics on how many frozen embryos are in storage in the U.S. but the NEDC and other organizations estimate that it may be as many as a million. People who have embryos frozen for fertility treatment often end up with more embryos than they will need for pregnancies. They have to decide whether to store them for later, usually at a cost; dispose of them; donate them for scientific research; or donate them to a clinic like the NEDC. Keenan and his colleagues make it clear they believe they are saving human lives. "We are a faith-based group," he said. "As an organization guided by our religious faith and protected by the Constitution of the United States, the NEDC firmly believes in the sanctity of life beginning at conception and recognizes marriage as a sacred union between man and woman as defined by scriptures of the Holy Bible," the NEDC says on its website. "We accept all embryos," Keenan said. But only couples who meet the clinic's religious criteria may adopt embryos from the center. The not-for-profit clinic receives federal funding and doesn't charge donors, although it does charge embryo recipients. Keenan said there wasn't anything unusual about the Gibsons. "It was a routine fertility story," he said. He said he transferred two embryos to Tina Gibson, and one baby resulted. "That's very common, that (all embryos) might not all survive," Keenan said. The Gibsons said in media interviews that they were looking for an embryo whose parents looked like them. They were not looking to set records in bearing a child. That sounds right to Adamson. "Individuals and couples tend to choose either sperm or eggs or embryos that have characteristics similar to their own," he said. "These include physical characteristics of height and weight; hair color and eye color; body build type as well as, of course, race; often religion or cultural background; education; physical activities; other talents and activities such as being interested in music or being interested in art or being mathematically inclined or scientifically inclined," he said. "Reproduction is a pretty personal thing." Keenan said he hoped the publicity around Emma's birth would encourage more people to donate embryos to other people. Adamson doesn't see a downside, even if he does not share the religious motivations. "I think it's a good thing when an embryo can bring so much happiness to a couple," he said. "This is a wonderful capability, that a little frozen embryo from 25 years ago can do that. At the end of the day there's a lot of social good here and I don't see social harm," he said. "People say, oh it's science but no, I think it's a gift from the Lord," Tina Gibson said.